Judy Hopps (Ginnifer Goodwin) has wanted to become a cop ever since she was a little child. There's only one problem - she's a four-pound bunny rabbit. Everyone, including her parents, tells Judy she's delusional, her dreams are too big, that bunnies can't be cops. Ever determined, Judy eventually graduates at the top of her class at the Zootopia Police Academy. She's officially the first bunny accepted into the Zootopia Police Department (ZPD). Judy makes the long trip from her hometown of Bunnyburrow to the thriving metropolis that is Zootopia, and is amazed at what she finds. Animals of every species, from hippos to hamsters, co-existing and thriving together. However, she's disappointed to find that, on her very first day, Police Chief Bogo (Idris Elba) has relegated her to parking duty. She does her best, but finds herself distracted by the juicier, more scandalous crimes surrounding her. 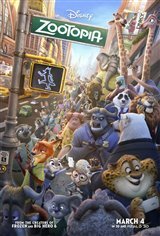 And when a distraught Mrs. Otterton (Octavia Spencer) comes into the precinct begging the force to find her missing husband, Judy volunteers for the job, much to the chagrin of Chief Bogo. This sets Judy on a dangerous path, while making unexpected friends and enemies along the way, to finally becoming the hero she always knew she could be.